PC Gamer Review: "The brutality of Darkwind is the most appealing thing about it. Your team ages ... You'll give them nicknames, train them, get attached to them, maybe even unlock specialities ... and then they'll die." Morgan, the 9th town in Darkwind, has now been released. Morgan is an isolated town nestled high in the Western Mountains. Beset by local pirates, it is a place where players will have to work together to gain special training bonuses. Morgan arrives with 5 new wilderness maps, bringing the total to 82. And there's more coming soon! 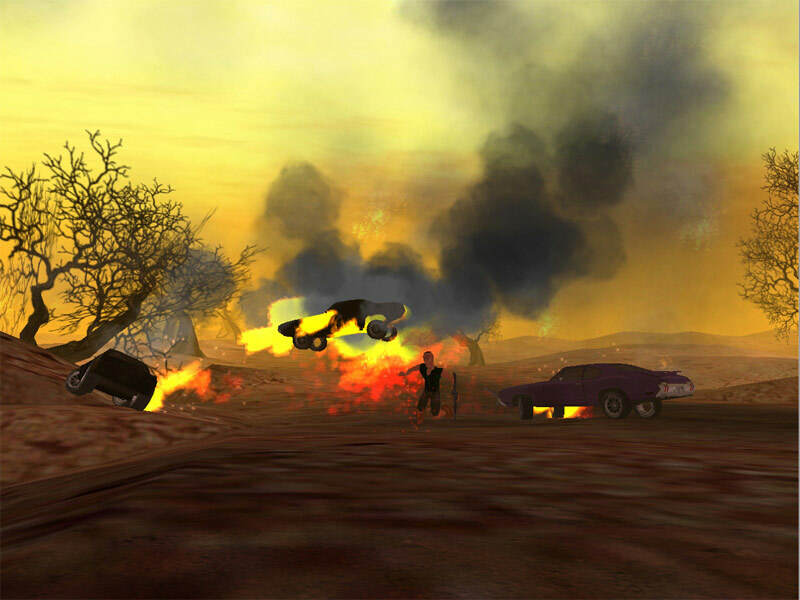 Darkwind is a free turn based tactical car combat game in the style of car wars online and Mad Max online. A free car wars computer game or car combat MMO. A turn based online strategy role playing game or war game. Similar games include Jagged Alliance, the Car Wars boardgame, and X-Com. Battle for survival and supremacy in the gritty post-apocalyptic world of vehicular combat where strategy and tactics determine winners and losers. Manage your gang, train your characters, design your own cars and scavenge for parts. Make your fortune in racing, deathracing and arena combat leagues, or venture into the wilderness and engage in tense multiplayer battles with pirates, traders and other players. Trade for parts, cars and weapons in the dynamic economy of a world where your characters will age, sustain permanent injuries, and die. The detailed weapon stats, and the detailed combat system with critical hits, injuries and healing, psychology and leadership ensure a strategic challenge like few other games. Award winning in the indie gaming community, acclaimed in the main-stream computer gaming press and praised in the war-gaming media: Play it yourself to find out why. No time limit free play. Set up a gang of characters and compete in races, death-races and arena combat leagues for an unlimited amount of time for free. Dark-Wind.com is a combat driving simulator. It's strategic rather than real-time, and you're not alone out there -- you control a whole gang of racers, shooters, and dirty double-crossers as you try to drive and survive what's left of our world. Dozens of thieves, misfits and assassins await your command. Arena combat, ranked races, and even paintball tournaments abound in cities across the island of Evan. It's our last refuge from a Sun that's burned away the rest of the planet. Yet life still finds a way...mutants, giant bugs, awesome mental powers...these are the harbingers of a new future for mankind. This is the new reality we are left with. It is your task to drive and survive. To kill or be killed. To be one of the players across the globe who have made Dark-Wind their own. Twist it by adding your own car and character skins, warp it with your own storylines in our community forums. Create your own destiny by managing a Camp and manufacturing headquarters. Drive to survive. Shoot to kill. Welcome, stranger, to Dark-Wind. Mad Max Fury Road. Darkwind, the multiplayer on-line turn based strategy war game has continued to push the boundaries of possibilities in on-line gaming with the integration of computer generated players who have improved their skills through cross breeding, natural selection, and learning from human behaviour. 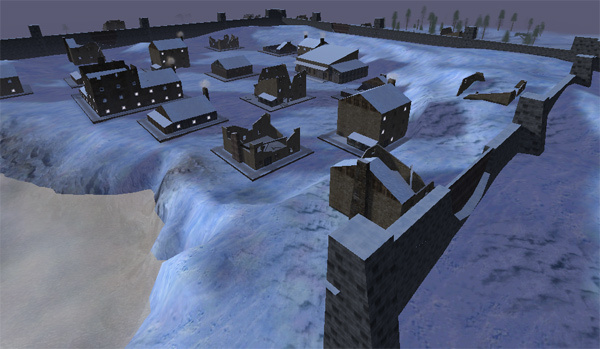 The game is one of an extreme minority to implement Genetic Algorithms (GAs) to breed new superior computer generated players who additionally can learn from the strategies of their human adversaries. The introduction of AI (Artificial Intelligence) techniques can make the behaviour of the computer agent more interesting, varied and believable as it has learned behaviours rather than rules being pre-programmed to determine behaviour. Genetic algorithms use techniques inspired by Charles Darwin's theory of evolution and survival of the fittest via natural selection: a population of individuals undergo selection in a system where variation inducing operators such as crossover of genes and ongoing mutations are present. The evolution starts from a population of individuals and happens in generations. In each generation the fitness of every individual in the population is evaluated and based on this multiple individuals are randomly selected and modified (recombined and possibly mutated) to form a new population. The new population is then used in the next iteration of the algorithm. A fitness function is used to evaluate individuals, and reproductive success varies with fitness. The results are the average fitness being increased with each generation. GA evolved computer agents/drivers are being introduced in Darkwind for specific track/car combinations in the racing environment. Effective racing lines for these combinations are being evolved through the use of waypoints. Computer drivers use these waypoints during the game to influence their behaviour as they navigate static and moving obstacles on the racetrack. This provides an evolved understanding of the overall shape of the track. The GAs have yielded an improvement of up to 30% in computer driver behaviour, but more importantly the use of GAs can make the behaviour of the driver more human like. Darkwind players are varied, and while some prefer Player-V-Player conflicts, others prefer to team up against computer adversaries. The introduction of GA evolved computer agents benefits all players and increases the challenge for the most effective players. AI is also being deployed in the wilderness area of the game for efficient path finding, obstacle avoidance and terrain navigation. The routes taken by human players over thousands of journeys per week as they navigate the wilderness are used as a form of route planning consensus by the computer agents in a similar manner to that of how ants use pheromones to mark their trail and guide following ants. If the trail is successful and more cars use it, the guidance becomes more intense and denser, whereas other trails fade out. This is much more effective than doing a cost-surface analysis where the computer agent makes a computational evaluation of the landscape around them as they traverse it, and therefore once again leads to more human like decisions and challenging opponents. Artificial Intelligence in gaming: Q&A with Dr. Sam Redfern lead developer of Darkwind: War on Wheels. Genetic algorithms are a form of evolutionary computation, which is a branch of artificial intelligence in which evolutionary approaches are used. They use techniques inspired by Charles Darwin's theory of evolution and survival of the fittest via natural selection: a population of individuals undergo selection in a system where variation inducing operators such as crossover of genes and ongoing mutations are present. The evolution starts from a population of individuals and happens in generations. In each generation the fitness of every individual in the population is evaluated and based on this multiple individuals are randomly selected from the population and modified (recombined and possibly randomly mutated) to form a new population. The new population is then used in the next generation of individuals. A �fitness function� is used to evaluate individuals, and reproductive success varies with fitness. The results are the average fitness being increased with each generation. The traditional approach to making a computer agent make a routing or "pathfinding" decision is based on computational evaluation of the landscape, for example the distance to get there by various potential routes. It doesn�t necessarily account for terrain, so for example, a computer agent may decide to drive up a very steep embankment, or around the edge of a cliff which a human player would be less likely to do due to the potential for car damage/death. Many of the subtleties of landscape navigation are computationally very hard to evaluate when you take into consideration factors such as momentum, wheel grip, and terrain types. These type of factors are not relevant in most computer games that require pathfinding, yet in Darkwind they are absolutely critical. Effective combat navigation is as much about mobility as it is about targeting weapons. Rather than making decisions based solely on a computational evaluation of the landscape, what we do is allow the computer agents to make use of the historic data recorded from humans playing the game. The agent doesn�t need to know why a large majority of humans took a certain route across a terrain: it just needs to know that they did so successfully. The computer agent is benefiting from the collective human processing of multiple data forms and is utilising the end results of this human behaviour. The routes taken by human players over thousands of journeys per week as they navigate the wilderness are used as a form of route planning consensus by the computer agents in a similar manner to that of how ants use pheromones to mark their trail and guide following ants. If the trail is successful and more cars use it, the guidance becomes more intense and denser, whereas other trails fade out. It has "perma-death" as well as long-term and permanent character injuries and ageing. This is very unusual in the MMO model and it is a strong part of the game's flavour since it leads to a gritty, dangerous world where death has real consequences. It also leads to a game where the stakes are very high. Many aspects of the game (travel, vehicle repair, healing, the economic simulations, character training) run to a real-world time scale. This makes strategic decisions about travel and trading important. You don't just magically appear at a town you're travelling to, you actually have to wait 18 hours in transit. Cutting edge computational AI techniques are being deployed which aim to improve the overall game experience for players rather than taking the standard basic approach to computer controlled agents. These elements all facilitate Darkwind holding the niche position it has as many users look for challenging alternatives to traditional MMOs.